Is It Time to Bail on Bank of America? The recent surge in Bank of America’s stock price has some commentators questioning whether it’s time to sell the bank’s shares. Given that Bank of America's (NYSE:BAC) stock has outperformed its closest competitors and reached a new 52-week high this month, there's a growing sense that investors should try to call the top and sell its shares. Consider this recent headline from Barron's: Bank of America: Three Reasons It's Time to Bail. To be fair, despite the headline, the article doesn't say that investors should sell their Bank of America shares. It instead quotes a report from Guggenheim's Eric Wasserstrom and Jeff Cantwell that downgrades the bank from buy to hold. The rationale in the report is threefold. First, Bank of America's shares are now within 10% of Guggenheim's fair value estimate. Second, any additional upside in its shares will be macro-driven -- i.e., outside of Bank of America's control. And third, Bank of America's valuation is now in line with the bank's historical level relative to its peer group. All of these things may be true, but given the headline of the piece it'd still be easy for shareholders to conclude that the article by Barron's, a respected and storied media company, is urging Bank of America's shareholder to shed their stakes. As a shareholder myself, I think this is bad advice. While Donald Trump's victory in last week's presidential election isn't without controversy, it's become clear that banks may be some of the biggest beneficiaries given Trump's promise to spur economic growth and roll back significant provisions of the Dodd-Frank Act. Most importantly, if Trump's administration adopts the approach recommended by Republican Representative Jeb Hensarling, who was purportedly being considered by Trump for Treasury Secretary, then it's almost certain that banks' earnings will dramatically improve. This follows from Hensarling's proposal to free well-capitalized banks from the suffocating capital and liquidity standards that have been enacted by financial regulators over the past few years. This would allow Bank of America to redirect potentially hundreds of billions of dollars' worth of its assets from low-yielding government bonds into higher-yielding loans. This alone would materially improve Bank of America's earnings. On top of this, if Trump is able to stimulate the economy through lower taxes and increased spending on infrastructure, as he says he's focused on doing, then Bank of America would benefit in two ways. A healthier economy would increase loan demand, and it'd also likely translate into higher inflation, which would free the Federal Reserve up to raise interest rates. Just how much might this help Bank of America? In its latest quarterly filing with the Securities and Exchange Commission, its 10-Q, the bank forecasts that a 100-basis-point increase in short- and long-term rates would translate into an additional $5.3 billion in net interest income. To put that in perspective, Bank of America currently earns only around $5 billion a quarter in net income. And the benefits don't end there, as Trump has also promised to dismantle major portions of the Dodd-Frank Act, which was passed in the wake of the 2008 financial crisis. One such change could be to take away the Federal Reserve's ability to veto big bank capital plans -- namely, dividend and share buybacks. Working in concert with higher earnings flowing from an improved economy and higher interest rates, this would almost certainly translate into a substantial increase in Bank of America's quarterly dividend. Indeed, even after the North Carolina-based bank raised its dividend by 50% earlier this year, to $0.075 per share, it could still double it from here while maintaining a dividend payout ratio in line with its closest competitors, JPMorgan Chase and Wells Fargo. It's those kind of things that lead to a rapid increase in value over time. Thus, while there's no getting around the fact that Bank of America's shares aren't as attractive today as they were at the beginning of November, it would be silly for shareholders to interpret this as a signal to sell their stakes in the nation's second biggest bank by assets. 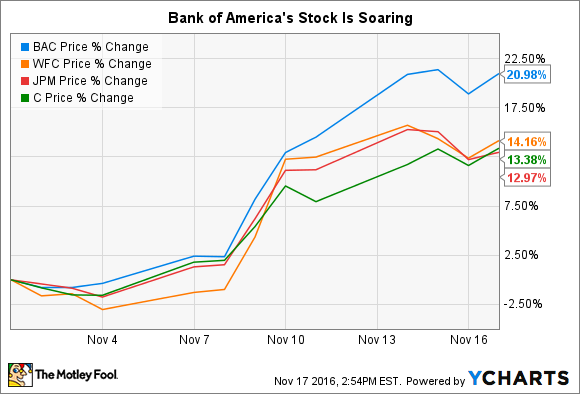 The best days are still ahead for Bank of America and its stock.